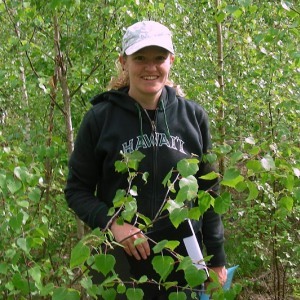 I am broadly interested in the evolutionary ecology of plants, and my research investigates how plants interact with neighboring plants and herbivores. Using greenhouse, field, and lab studies, I aim to understand how particular plant traits and suites of traits mediate interactions with competitors and herbivores and how these traits vary within and among populations and species. An emphasis of my research has been to investigate how plant defense and herbivory change over the course of plant ontogeny. Quintero, C., K.E. Barton, and K. Boege. (In press) The ontogeny of plant indirect defenses. Perspectives in Plant Ecology, Evolution and Systematics. Barton, K. E.. 2013. Ontogenetic patterns in the mechanisms of tolerance to herbivory in Plantago. Annals of Botany 112: 711-720. Barton, K. E. and M. E. Hanley. 2013. Seedling-herbivore interactions: insights into plant defence and regeneration patterns. Annals of Botany 112: 643-650. Barton, K. E. and M. E. Hanley, editors. 2013. Special Issue: Seedling Herbivory. Annals of Botany 112: 643-765. Koricheva, J. and K.E. Barton (2012) Temporal changes in plant secondary metabolite production: patterns, causes and consequences. In The Ecology of Plant Secondary Metabolites: From Genes to Global Processes. Eds. G. R. Iason, M. Dicke and S. E. Hartley. Cambridge University Press. Boege, K., K. E. Barton, and R. Dirzo (2011) Influence of tree ontogeny on plant-herbivore interactions. In Size and Age-Related Changes in Tree Structure and Function, Tree Physiology 4. Eds. F. C. Meinzer, B. Lachenbruch and T. E. Dawson. Springer, New York. Barton, K.E. and J. Koricheva (2010) The ontogeny of plant defense and herbivory: characterizing general patterns using meta-analysis. American Naturalist 175:481-493. Sultan, S. E., K. Barton, and A. M. Wilczek (2009) Contrasting patterns of transgenerational plasticity in ecologically distinct congeners. Ecology 90: 1831-1839. Barton, K. E. (2008) Phenotypic plasticity in seedling defense strategies: compensatory growth and chemical induction. Oikos 117: 917-925. Barton, K. E. (2007) Early ontogenetic patterns in chemical defense in Plantago: Genetic variation and trade-offs. American Journal of Botany 94: 56-66. Barton, K. E. and M. D. Bowers (2006) Neighbor species differentially alter resistance phenotypes in Plantago. Oecologia 150:442-452. Barton, K. E., N. J. Sanders, and D. M. Gordon (2002) The effects of proximity and colony age on interspecific interference competition between the desert ants Pogonomyrmex barbatus and Aphaenogaster cockerelli. American Midland Naturalist 148: 376-382. Ackerly, D. D., C. A. Knight, S. B. Weiss, K. Barton and K. P. Starmer (2002) Leaf size, specific leaf area and microhabitat distribution of chaparral woody plants: contrasting patterns in species level and community level analyses. Oecologia 130: 449-457. Sanders, N. J., K. E. Barton, and D. M. Gordon (2001) Long-term dynamics of the distribution of the invasive Argentine ant, Linepithema humile, and native ant taxa in northern California. Oecologia 127: 123-130.